Not everyone might be keen on jumping the wagon when it comes down to signing up for a contract to experience T-Mobile’s 4G HSPA+ network, but for those who wish to have a little bit more leeway, there’s always the prepaid route. 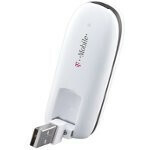 Luckily, T-Mobile is now selling the prepaid Rocket 4G USB modem just for a mere $59.99 – which is pretty nice considering you’re not tied down with any commitments. 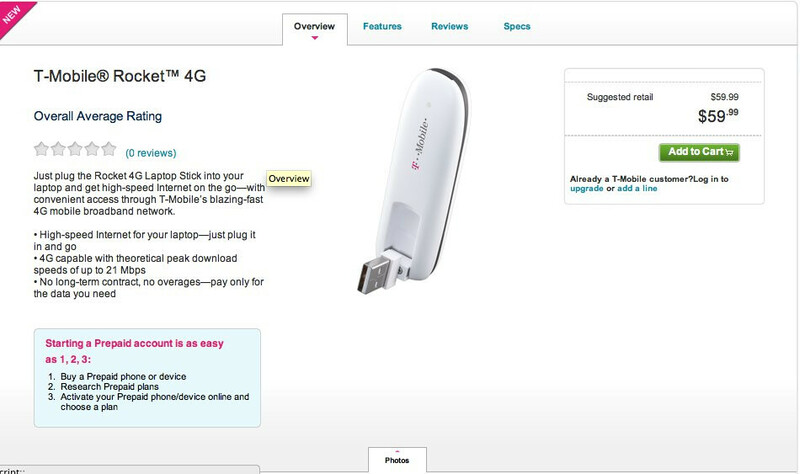 Sure you can pick up the recently launched T-Mobile 4G Mobile Hotspot, but you’ll have to make payments on that thing for the next 2 years. Moreover, Big Magenta announced that they will be updating the pricing structure with their Mobile Broadband offerings, and from the sound of it, they’re keeping most of the prices the same, but they’re giving more data allotment with each one. Currently, you can pay $10 to get 100MB of data that’s good for 7 days, $30 for 300MB of data that will last for 30 days, and $50 to size up with a 1GB plan for one month. Going into effect on April 17th, you can now pay $30 to get 1GB of data or $50 to get a respectable 3GB cap. Hey PA... I notice you still have to take a swipe at TMO in nearly every article you write. Is there a specific reason for your total lack of ability to just report something without adding negativity to it?? "Sure you can pick up the recently launched T-Mobile 4G Mobile Hotspot, but you’ll have to make payments on that thing for the next 2 years." 1) if you do it on contract, its a mere 80 bux. If you put it on your bill on contract it can only be billed up to 4 months, not 2 years. 2) if you do it on no contract its a mere $150 which you can break over 20 months, at a whopping 7.50 a month. Add that to the fact that the plans are 40 bux after subscriber discount, and your still less than 50 bux for the whole thing, 21mb/s 4g service and 5gigs with a softcap. What is there to complain about???? Who else even lets you split your phone up into payments??? Looking at the competition, thats the best deal out there. Shouldnt you be celebrating Tmobile for that instead of trashing them? Or is this site really paid by ATT/Apple like everyone thinks??? geesh.